Copper piping is Genmor Plumbing's specialty! Each of our technicians specializes in a specific area of repiping. You will receive the greatest possible quality in every area of the job. Genmor Plumbing is licensed, maintains liability insurance and Worker's Compensation insurance. We do our own work! 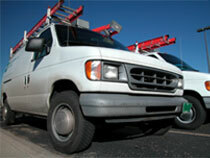 Our in-house technicians and plumbers perform all of our work. We do not sub out any portion of our jobs. We have a full time patching crew to assure prompt and professional service. We are committed to providing top quality workmanship and our jobs are 100% guaranteed. We complete our work in a efficient, clean, professional manner. 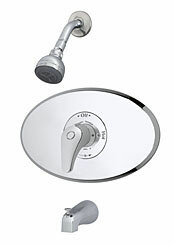 Genmor Plumbing features the Symmons Temptrol single handle pressure-balancing combining valve for our tub and shower installations. Symmons Temptrol mixing valves come with a lifetime limited warranty to insure you years of worry free service. • We use type "L" copper piping which is thicker piping than required by code for durability and strength. • Our 1/4 turn ball valves are superior quality and strength for durability and ease of operation. • Compare our stainless steel supply tubing to other compainies who use plastic tubings. • We insulate ALL hot water pipes under your house for maximum energy efficiency.